I found this metal heart at Micheal’s and thought it would be fun to spell out some words with the heart symbolizing “love” or “heart”. For example you could spell out GRATEFUL “heart”, THANKFUL “heart”, FALL “love” or WHO “loves” YOU. I am sure you can also think of other combinations to spell out. So first I had to figure out what I was going to spell out so I would know how many pumpkin blocks I would need. I had my husband cut out 8 sections of 2×4, 4 1/2″ long and sand them with a hand sander. He then drilled a hole in the center top for the stems. I cut tree branches 3″ long for the stems trying to keep them all about the same diameter. Since oranges are usually more transparent than other colors I primed my blocks with white Gesso and then basecoated them with Persimmon ( I used DecoArt paint). Since I wanted to show you more than one choice I decided to paint both sides of my blocks so that they would be reversible. I decided to use two different stencils on each side. I used Tim Holtz stencils Tracks (THS044) and Bubble (THS002) on the one side and Splotches (THS037) and Harlequin (THS016) on the other side. I varied the pattern on each of the blocks and also the colors using Spiced Pumpkin, and Tangerine. I placed a piece of blue tape across the bottom of each block so that I could make sure that my letters would be even. You could use a stencil, stamp or freehand your letters. I use DecoArt Sleek stencil on one side and Quirky on the other side of the blocks. I stenciled the letters with Bittersweet Chocolate. I lined the one set of letters with Marigold and the other set with Foliage Green. Varnish blocks and glue stems into place. I then shaded the edges and painted in veins. Glue into heart. 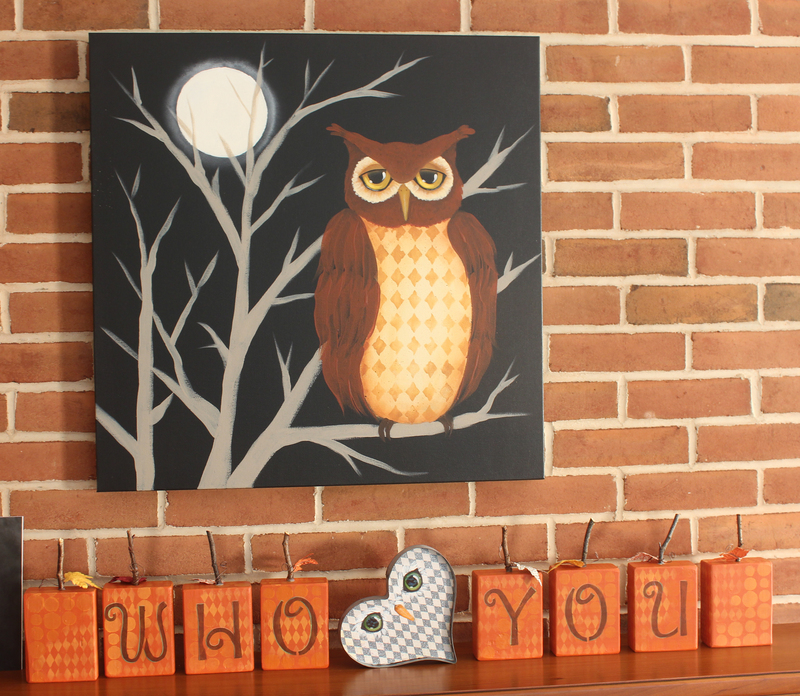 On the other side of the heart I painted and owl face. In this picture the eyes are a little cloudy because I used DecoArt Liquid Glass over the eyes and nose to make them shinier and appear dimensional. I then glued him into the other side of the heart. At Micheal’s I had found leaves on a wire. I twisted the leaves around each stem. You could also glue a piece of wire to a silk leaf and do the same thing. Thanks Penny, and thanks for following me!